ENTREPRENEURS Jacob and his mom Esther Diaz. Esther Diaz was looking for an organized way for her eight-year-old entrepreneur son to save his hard-earned money. 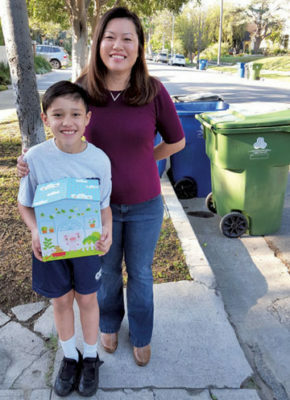 Since he turned five, Jacob has rolled in trash, recycling and yard waste bins for two or three neighbors after the city’s weekly pick-up service on his S. Sierra Bonita Ave. block. He charges $2 each trip to the curb and back. He stuffed his profits in a piggy bank. But it was hard to get the paper money and coins in and out. “Sometimes I had to use chopsticks,” said Jacob. There must be a better way, thought his mom. The health care professional designed The Piggy Box, a house-shaped box made in six styles, of recycled paper with three drawers labeled: Spend, Save and Give. “We wanted him to learn he could do more than purchase the latest toy,” his mom explained. The drawers help him achieve his goal—buy an iPAD—and give to school can drives and disaster relief programs. The third grader sometimes gets assistance from his sister, Bella (6 ½). Both attend Cathedral Chapel School. Their mom also got a little help from her tech-savvy brother-in-law to create The Piggy Box app. The app keeps a running total of Jacob’s income and spending to help determine if he can afford an impulse buy. All in all, the high-tech Piggy Box “makes it a lot easier,” than the old-school model, says Jacob. The Piggy Box is available at thepiggybox.com and at Miracle Mile Toys, 5363 Wilshire Blvd. It retails for $39.99. The app is free.